So my first reaction to this, somewhat belated, challenge was the Arbutus Greenway. 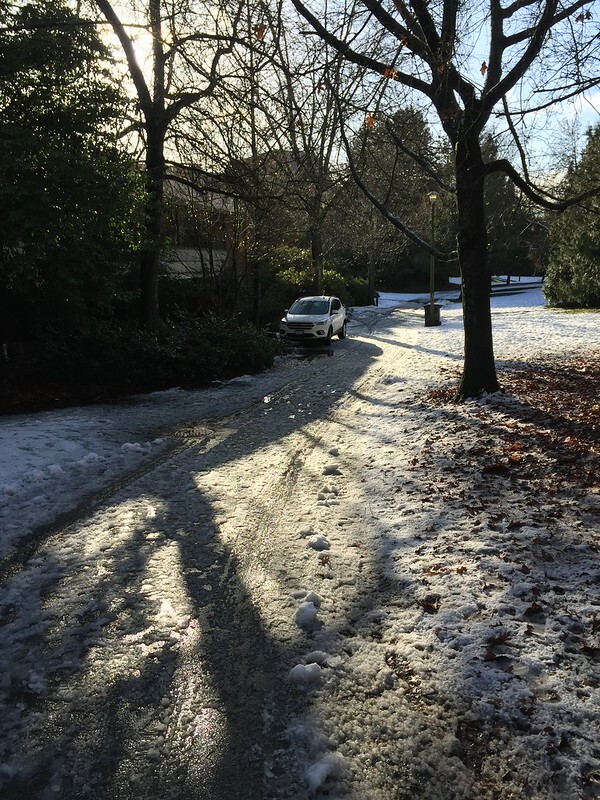 But the first photo I came across on my flickr photostream was this more recent one – of the path through the Arbutus Village Park. The path I use most often. This was taken before Christmas, but it might as well be today. 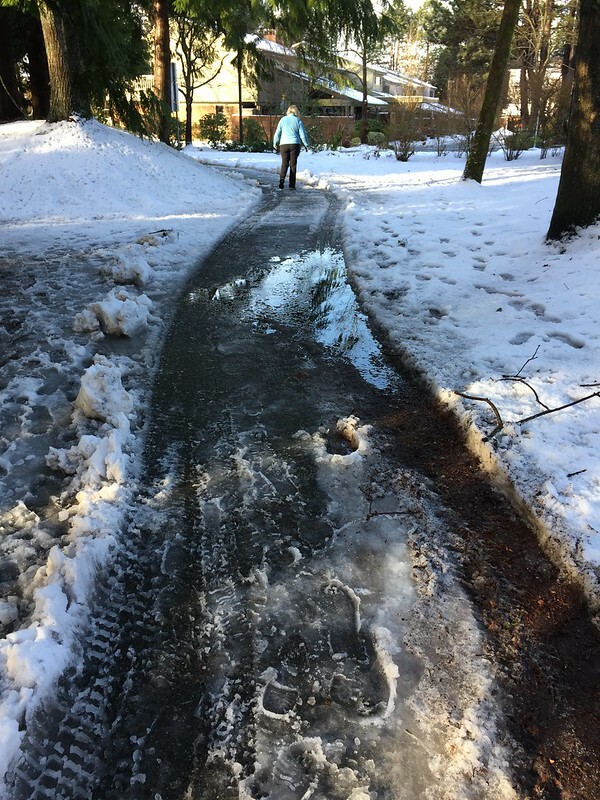 While major roads get salted and ploughed when it snows, and sidewalks are supposed to be shovelled by the property owners adjacent to them (but more often aren’t) paths get neglected. 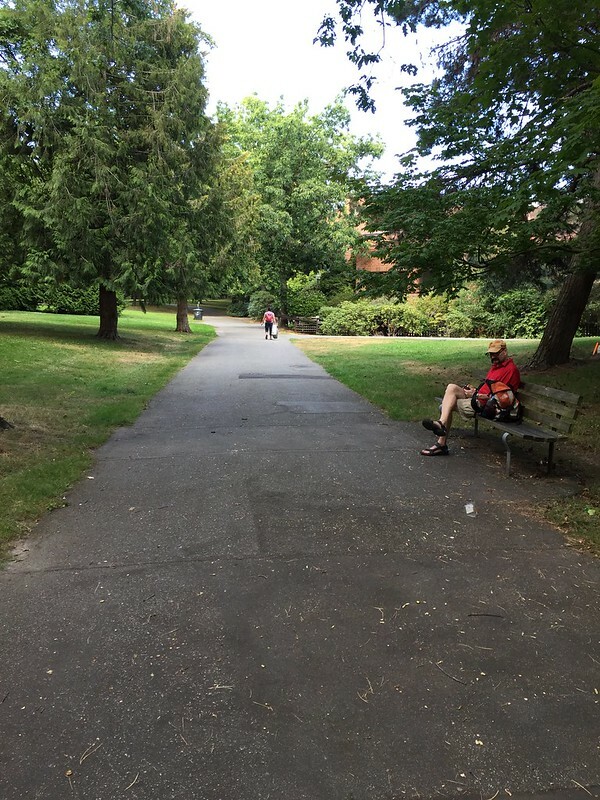 This is what it looked like back in August – and I took this picture to illustrate another blog post about the use of blacktop for pedestrian/bike/non-vehicle paths. Because I use this path all the time, I rarely think to take a picture of it. I believe that we need more car free paths – indeed to illustrate the point I even curate a flickr group called Places Without Cars – though I have had to close it to any more pictures as so many people do not seem to understand why pedestrian only streets and plazas are worth documenting. 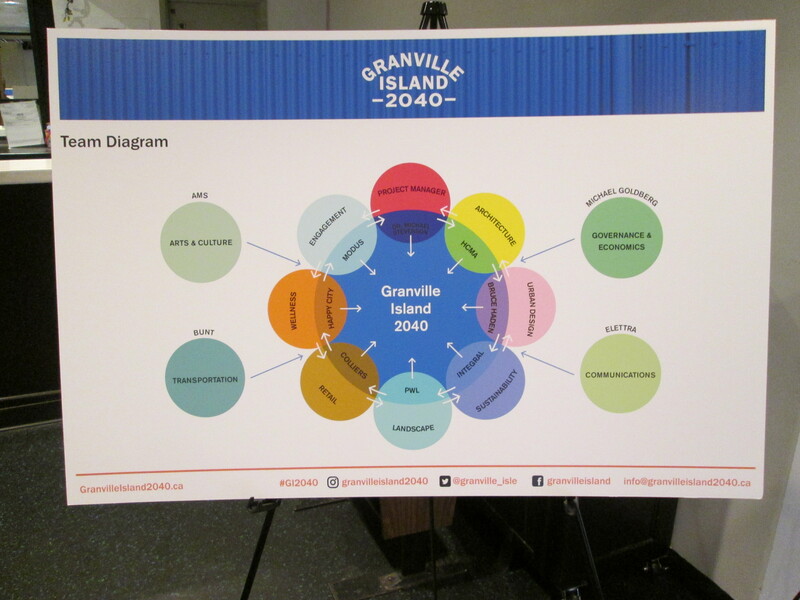 I went to the “Open House” on the Granville Island 2040 plan this afternoon. This was not an open house format in any sense I would use. There were three longish identical presentations during the day with an opportunity to ask questions or make comments at the end of each. A few display boards were in the Revue Stage Lobby – so this one was the leftmost of the icons in the image above “Draft Directions”. Apart from these boards, there were no materials being distributed nor is there very much on the Granville Island web page. It may be that the presentation may be made available there later as there was a tv camera pointed at the presenters. I did not stay for the comments and questions. The theatre was by no means full: I estimate around 70 people were present and I do not include staff or presenters in that number. The presentation was made by Darryl Condon of the architecture company HMCA retained by CMHC. While there were several others at the two top tables, on the stage, facing the audience none of them gave formal presentations but were available to answer the comments and questions. As you might expect I was most interested in what is being termed CarLite. Access is a critical issue, and reducing car use depends on increasing the availability of alternatives. Currently 1/4 of the Island is roadway or parking. There are 980 parking spaces on east side and 300 on the west (Granville Bridge being the middle). There is a declining use of cars to get to GI (increases in walking, cycling and use of ferries were reported in an earlier post) The aim is to make the west side car free, while maintaining access for deliveries, people with disabilities and drop off and pick up of passengers. This is expected to produce more vitality and activity. Many places have already made significant progress in prioritizing pedestrians e.g. The Rocks, Sydney; DUMBO and Times Square, New York. It is also intended to increase the amount of nighttime activity following the examples of Amsterdam (which has a Night Mayor) and Brixton which has a Night Market. I want to intervene here to point out that despite the commitment to increasing inclusiveness, there was no mention of the very successful Richmond Night Markets. It was also noted that the present arrangements allow little access to the water, and a number of suggestions were offered as to how to increase this including sales from boats or places to “dip your toes in” False Creek. The Public Market will be expanded to be more than a building: it will become a precinct with open air stalls, food trucks and the like. There is also a commitment to make greater use of the many “in between spaces”. With the reduction of car park spaces, there will be a greater opportunity of large flexible spaces and mixed use. The display map in the lobby was nothing like the present proposal, which is now designed as both a curve, landing further north west and not crossing at the narrowest point. This will allow for use by pedestrians and cyclists, protect the “sanctity of the green space” and link to an enhanced path along the northern edge of the island. Examples of curved bridges as art pieces with sculptural quality were shown but not identified. 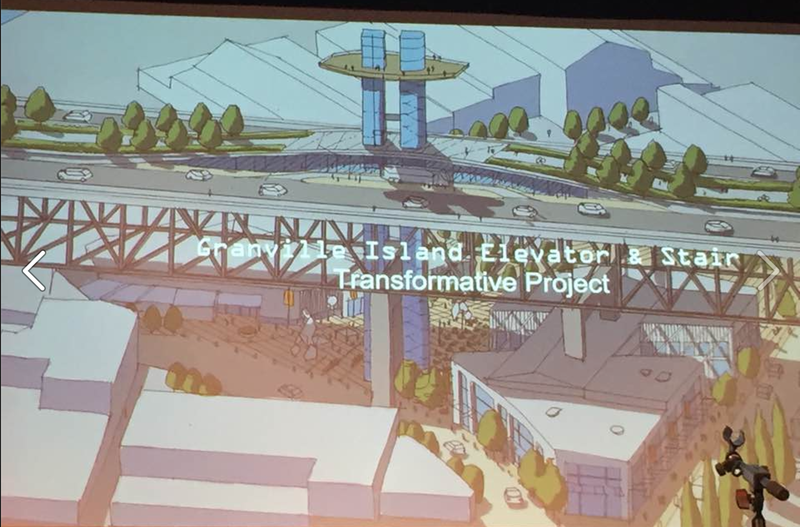 Two alternatives were shown for an elevator connection to Granville Bridge. The bridge now carries 6 bus routes, with an effective average 2 minute wait time for a bus between GI and downtown, but getting to GI now is actually not that easy. So an elevator to midspan bus stops makes obvious sense. What makes much less sense is the City proposal of a median “greenway” on the bridge. Any pedestrian would, I think, prefer a view of the water and the scenery rather than of lots of traffic. (One idea I have seen that was not shown is a walking deck beneath the car deck.) An elevator to a median bus stop would require structural alterations to the bridge. So if there were two elevators, one for each direction of bus service, they could be built outboard of the structure. They might even be temporary initially as a proof of concept, but more elaborately could include a wider sidewalk and bumpout bus stops – again my thoughts not what was shown. This was also in the lobby but not mentioned in the presentation. The final report is now available as a pdf file. The elevator is in but only one and to the median of the bridge – assuming the City goes ahead with its middle of the road greenway. The new pedestrian/ bike bridge on the eastern with its seductive curve is also retained: a straight bridge would be a lot cheaper but would bring more through movement to an area current Island workers want kept quiet. Except for shows and concerts, outside of working hours. 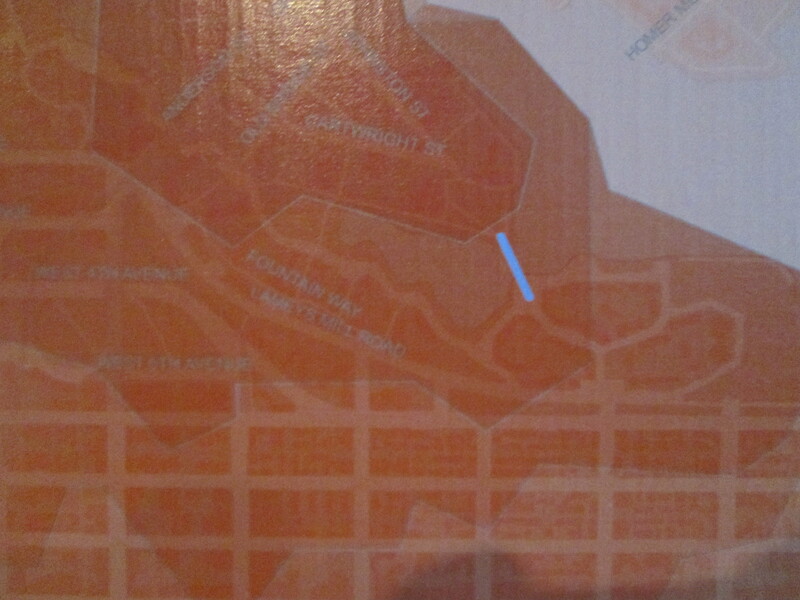 The Olympic Line gets a nod but is left up to the City. There is quite a bit about the need to generate revenue and no expectation of more federal funds. I went this morning to a workshop called “Getting to and Moving Through Granville Island”. 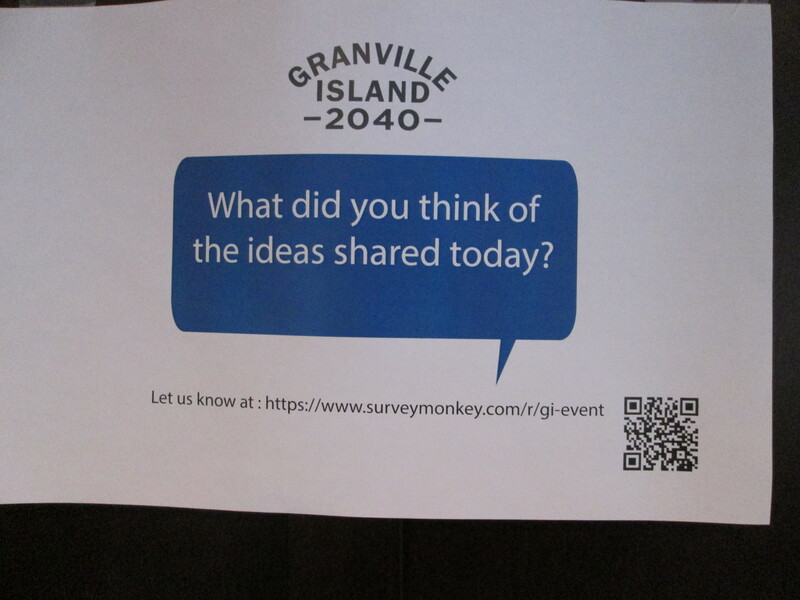 It is part of Granville Island 2040, “a planning initiative that will set out a comprehensive direction and dynamic vision for the island’s future” organised by CMHC and Granville Island. The session, facilitated by Bunt & Associates, collaboratively reviewed current infrastructure, mobility services and travel patterns as well as seeking ideas and opinions on critical transportation elements for the Island’s future. It was a group of about 20 “stakeholders” which included local residents’ associations, City of Vancouver staff, Translink, both of the ferry companies, the local business association, BEST, Modacity and Ocean concrete. 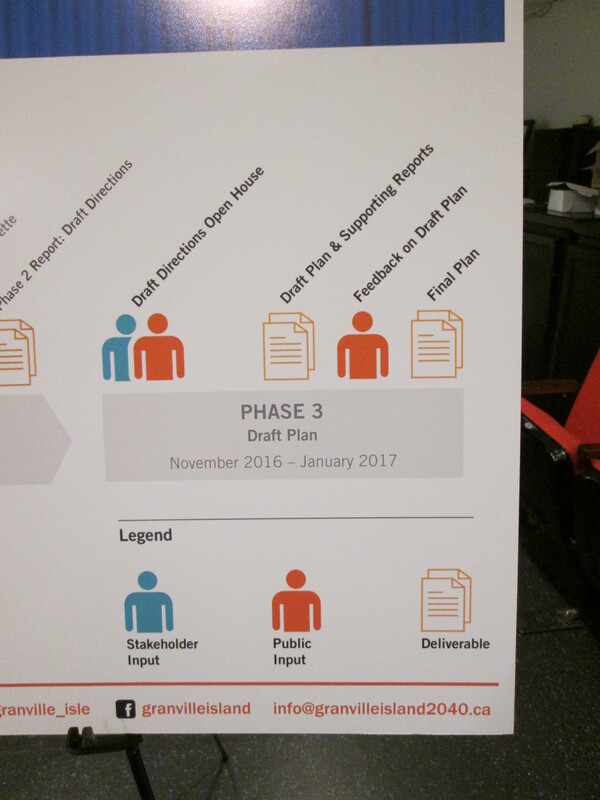 There had been a meeting the previous day dealing with land use, and there will be many more opportunities for people who are interested to get involved. You can even Instagram your idea with the hashtag #GI2040 – which I have already done. But there’s a lot more to this idea that I want to write about. First of all I think it is very unfortunate that the process separates out transportation and land use, since I am convinced that these must be considered together: they are two sides of the same coin. Secondly the process centres around the vision for what people want to see by in 2040, and then there will be thought about how to achieve that. I think it is immediately apparent that CMHC has its own process for deciding how to replace Emily Carr University when it relocates to False Creek Flats. This long term vision has to assume that it sorted out, and that CMHC has achieved its own objective of seeing increased levels of activity on the Island. The workshop started with a presentation by Bunt & Associates of some recent transportation data they have collected last month, compared to data collected on the same days in August 2005. I did not take notes, thinking that there might be a handout or perhaps material on the website. So I am forced to summarise the findings without any of the figures in front of me. There has been an increase in the number of people going to the Island, but a drop in the number of cars. The increases come from increased use of the ferries, pedestrians and cycling. They conducted cordon counts between noon and 6pm midweek and a Saturday and a very limited interview survey, to help identify where people came from, how many were in the group and how much they spent. Car occupancy has increased. 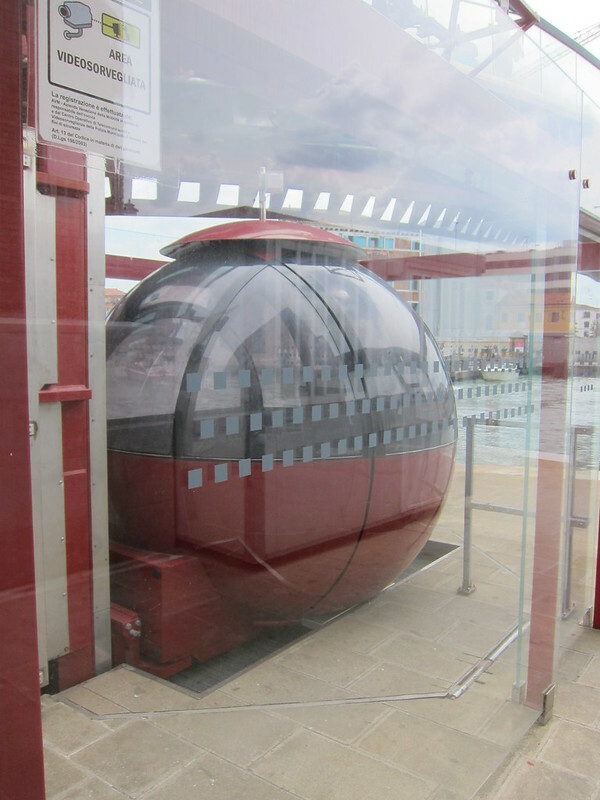 The Island is now also on the itinerary of the Hop-on/Hop-off service which wasn’t the case ten years ago. There were some very obvious weaknesses in the data. For instance, transit passengers were only counted at the cordon when they got off the #50 bus. 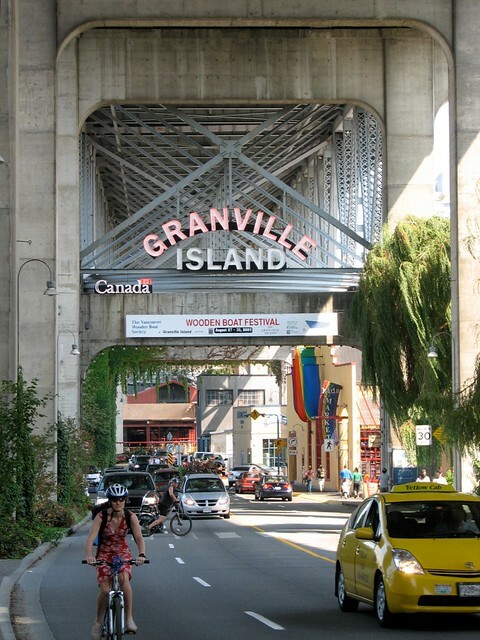 It is my observation that many people walking into Granville Island have come from the bus stops at the southern end of Granville Bridge. While some of that “multi-mode” travel is apparent from the interview survey, it is not like a trip diary. There were also no counts in the evenings, when the use of Granville Island shifts considerably to the theatres and destination restaurants like Bridges and Sandbar. There were the usual workshop activities of putting sticky notes on maps and talking in breakout groups, and some of the common ground was apparent early on. Reuse of the abandoned Historic Railway to connect to the mostly empty parking lots and Olympic Village station, for instance. By 2040 that may even extend to the tram envisioned for the Arbutus Corridor, and even if that can’t be achieved by then, the Greenway linkage to the Seawall was a favourite too. Currently while pedestrians and bikes have a few options, vehicles have only one, and I am relieved to report that no-one thought there should be more. In fact the traffic count shows that the current four lane access is excessive, and could be replaced by two lanes with the space better utilised by dedicated bike lanes, wider sidewalks and possibly a tram line. The idea I want to examine in a bit more detail was popular with the transportation people, but might have some resistance from the “Islanders” i.e. the people who work there everyday. But I will get to that later. There is a 50 meter channel between the east end of the island and the separated pedestrian and bike paths of the seawall. 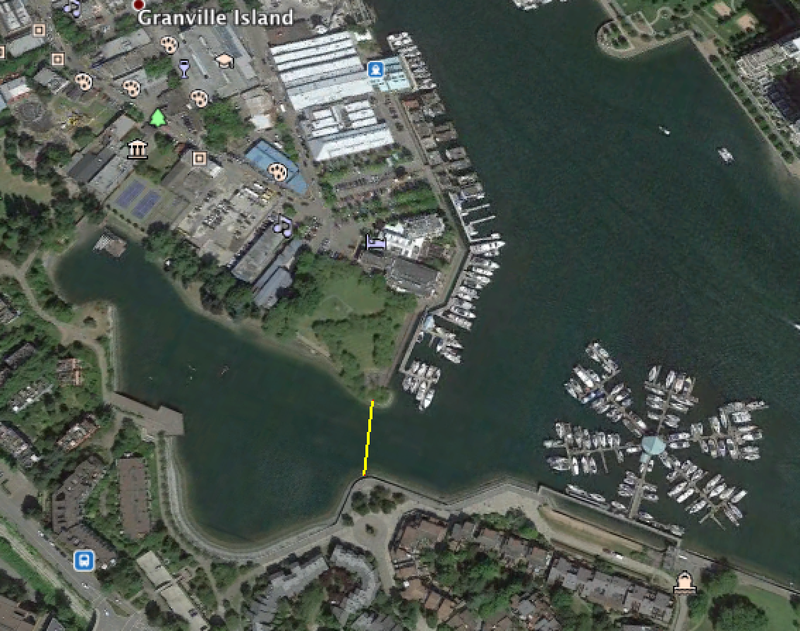 There is very little boat traffic into the pocket of False Creek: the main exception being people in kayaks and dragon boats using the docks south of the Community Centre. 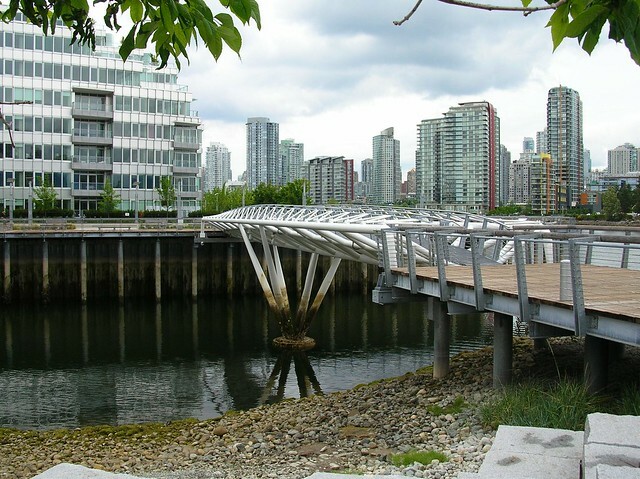 My first thought was that the almost useless Canoe Bridge at the other end of False Creek could be relocated. But it is both too short (only 40 meters) and has that really ugly support in the middle. I also dislike the fact that the entrances onto the bridge are narrower than the middle, which seems to me to be utterly pointless. 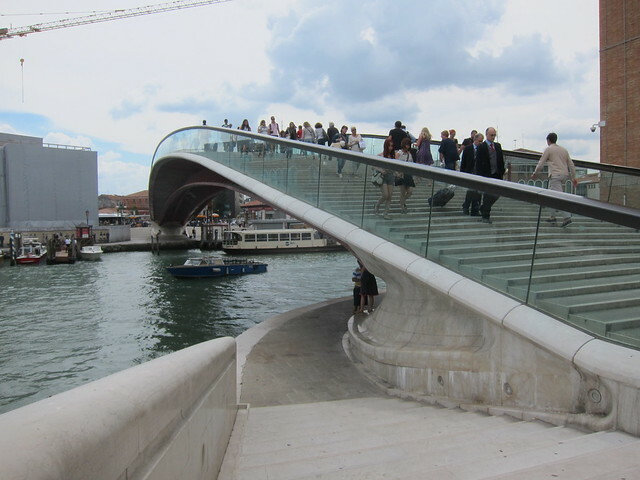 I also wonder about the flat underside, and whether an arched bridge might be better both operationally – for boats given rising sea levels – and aesthetically. My inspiration is from one of the newest bridges in Venice, Ponte Della Costituzione also known as Calatrava Bridge after its designer. This is much too big for our location – 80 meter span and up to 17.7 meters wide in places. But you must admit it is very beautiful: in fact it well illustrates my dictum about a lot of architecture – it looks pretty but it doesn’t work very well. It has a lot of steps, some of them very steep, which makes it a barrier to people on bicycles (intentionally) and people with disabilities. 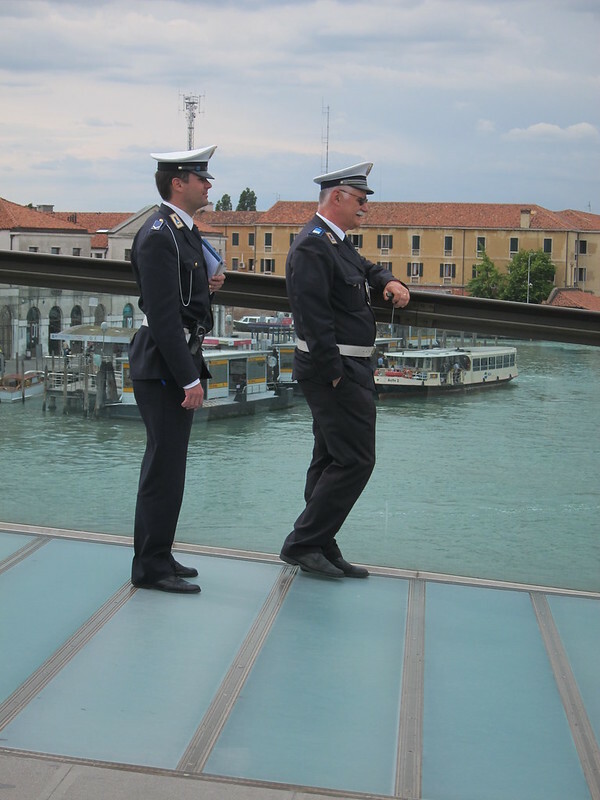 Actually bicycles aren’t permitted anywhere in Venice, but although this bridge might present a challenge, evidently not enough of a challenge, hence the presence of the local plod. No, I don’t know how often they have to be there, but they did have quite a few folks to talk too while I was there. However, I am pretty sure that someone can come up with a better design of a bridge for the 50m gap, and a way of ensuring that it is not a cycle freeway, but a gentle stroll for pedestrians. 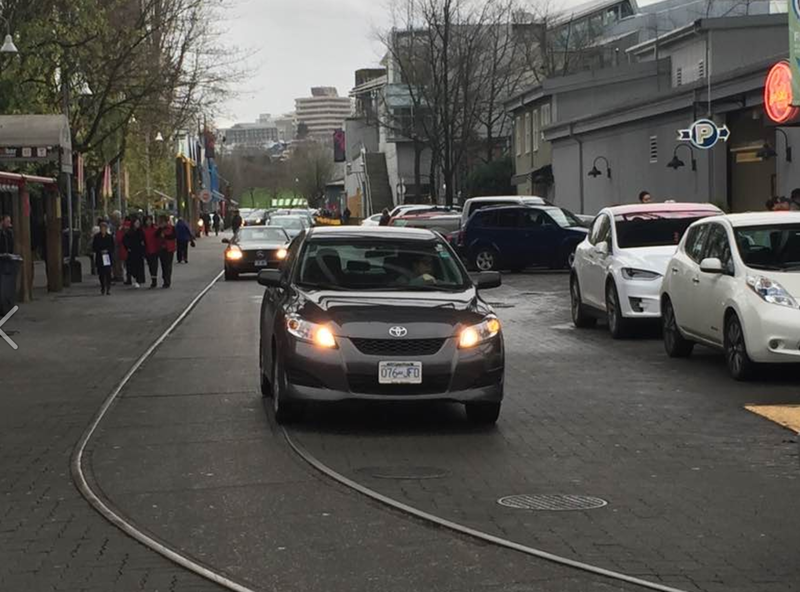 The reason is not that I am anti-cyclist, merely tired of the constant aggravation of the “shared space” on the seawall, which the City is now dealing with. It is also essential to the mandate of Granville Island 2040 that none of the Island becomes a through route to anywhere. One of the reasons that mixed use and shared space has worked so well here is that the Island is the destination. It is an exercise then in placemaking, not making through movement faster or more convenient. Indeed unlike so many places in Vancouver which now advertise “this site may have an antiloitering device in place” we must come up with lots of ideas to implement loitering devices – things to encourage people to linger. Or as Brent Toderian likes to call them “sticky places”. There is one such place now at what would become the landing place of the new bridge. Ron Basford Park is one of the few quiet places on the Island, where people who work there seek peace: somewhere to have a picnic lunch or breastfeed their babies. It is the end of the Island and there is a footpath around its perimeter. I think it is quite possible to design the end of the proposed pedestrian bridge to ensure that this peace is preserved. If the bridge is used as way to get people on bicycles on and off the Island more quickly, there will be considerable conflicts at both ends. But Ron Basford park is also home to amphitheatres: there are concerts and all kinds of activities at other times. 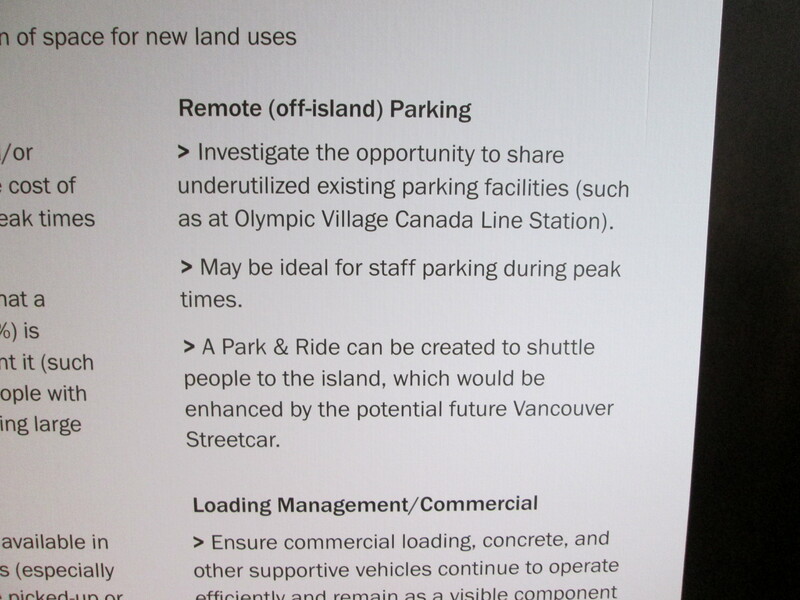 So the Granville Island management is going to have to display some pretty nifty consultation expertise here. Granville Island is a unique place. It seems to defy all reason and logic, but it undeniably is very successful as a destination, and whatever happens will need to preserve as much of the place’s eccentricity as possible. Or even enhance it. As Dale Bracewell remarked at the end of the session, Granville Island actually needs several transportation plans for different times of day, days of the week and times of the year. In the summer, the Island attracts at least half of its users from the rest of Canada and other countries – people who probably only visit the Island once. In the winter, the Island – and its market in particular – is the place that most people in the vicinity rely on for groceries. As the residents’ association rep pointed out, they are the people who keep the market going in the winter. There will be further traffic counts later on in the year, to measure the different pattern that emerges when tourists are a less significant part of the mix. And, of course, there will need to be some reflection of what happens once the University leaves: there are around a thousand students now, plus staff and support workers. There were some hints about how the land use will change. The buildings underneath the bridge, currently used as parkades, are likely to be repurposed. The area at the west end of the Island, currently where there is free parking for the Public Market, will likely see reuse that better utilises its location. But all of this depends on getting more viable choices for transit. 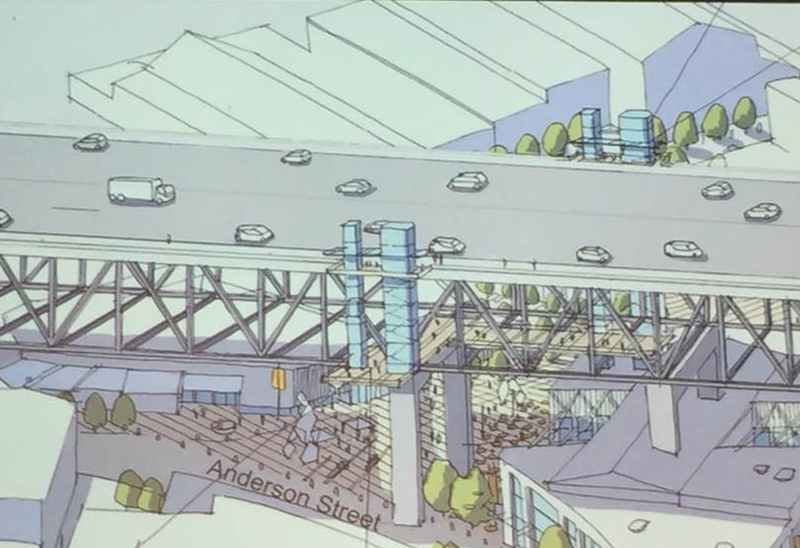 So the other really important idea is the installation of elevators up to the bridge deck with new bus stops. Sadly, the City is still wedded to the notion of a centre median greenway – which is utterly daft. The reason people walk over the bridge is the view. No-one is going to want to walk a long way across the Island and the creek with no view other than four lanes of fast moving cars!